It comes but once a year, and I ain’t talking about Christmas. I’m talking about the phenomenon that turns grown, respectable women into snatching, feverish, morally challenged mongrels: the Clegs Boxing-day remnant sale. Oh boy. In preparation for such a day, I make sure I exercise vigorously for at least three months prior, and I practice gripping my fabric in my own stash at home, to build up my grasping reflexes to prevent fabric being stolen from my clutches. The following day my body is usually riddled with round purple bruises; the lasting memories of vicious elbow jabbing. Yes ladies and gentlemen, things get messy at the remnant sale. Picture a massive table with heavily reduced fabric gems, surrounded my fabric obsessed women frothing at the mouths. Eyeballs were lost, and a good stiff drink is needed afterwards but by golly it’s worth it! Naturally I was there right at the start of the sale, elbows out and purse stashed with Christmas money (no one asks me what I want any more, they just give me money for fabric). I picked me up some absolute treasures. 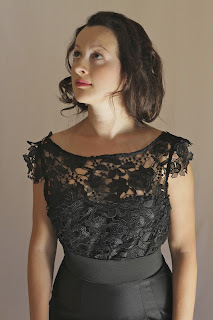 Now I’m a sucker for a nice lace, but here in Australia if you want to buy lace fabric, you must be willing to mortgage most of your limbs to afford it. So at remnant sales my number one most desired item is their lovely lace remnants where prices are reduced to 50% or more. I was lucky enough to get my claws on half a metre of this g-orgeous black guipure lace and I’m almost certain I heard victory bells playing when I pulled in that fold of fabric close to my chest away from others reach. Now as manic as this environment is, I find it oddly inspiring, and with my adrenalin going out of control lots of dress ideas start etching their designs onto my feverish brain. And thus we are introduced to my new dress. I call it; “Survivor” (dramatic much?) as it managed to evade the sea of women’s arms to be united with me. The dress is my own design and you will see echoes of my previous looks. One of them is my new favourite thing, elastic waist bands. Once again I joined the torso and skirt together with a thick piece of elastic for the waist, and then top stitched it down. I was so happy with the effect the elastic had on my 'Elastic Fantastic' skirt, and I was just as happy to see it work on the dress. It just really emphasises the female shape and pulls you in those areas that you want pulled in. The fabric I used for the skirt was a 40% silk/60% polyester blend, which I know, I know, is like mixing good wine with cheap lemonade. BUT the result of the hybrid is a super shiny (thank you silk) and super tough (thank you polyester) fabric which makes for easy sewing with a flattering firm fit. It’s strong enough to hold you in the right places. With my shape I almost always avoid softer fabrics when sewing fitted garments for my lower half as the soft fabrics (hate me) only emphasize my ‘junk.’ On the flipside, I tend to use soft fabrics on my top half, the smaller half of my body. I cut out the lace into smaller parts to make cute little cap sleeves which I think add to the 'delicate' look of the dress and soften the shoulders. As you can see in the above picture, I used bias binding for armholes seam allowances and the neck. I made up the bodice shell in the lace, and then cut out the love heart strapless bodice separately in the silk/polyester. I then attached them together at the side seams and sewed the love heart bodice onto the bodice shell along the top of the love heart. That involved a lot of careful pinning. I also cut a low V back to emphasise the detailing of the lace, and using the scalloped edge of the lace. I'm very happy with how the dress turned out, and I'm still ridiculously excited about elastic. I apologise in advance dear readers if my next few dresses have elastic in them! You know I go a little crazy when I get excited about something. The combination of black shiny silky/polyester with black lace makes for what I think is a classy little number which is timeless. I'm also really having a lot of fun playing with pattern drafting! It's gotten me so inspired! 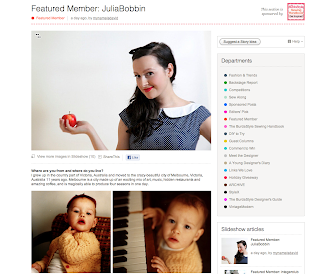 On an exciting side note: I am this week's BurdaStyle's featured member! Yay! You can read my interview on their website here! 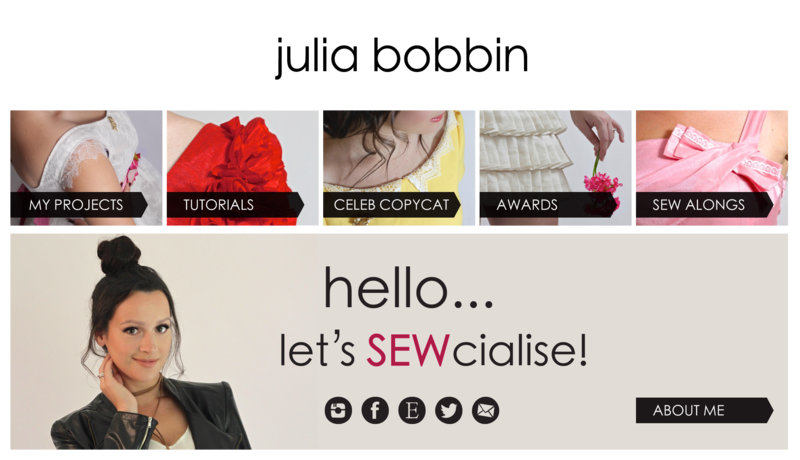 I am absolutely tickled pink to have my first ever sewing interview! Thanks BurdaStyle! A massive thank you to all my lovely readers who have supported me and my new blog in 2011. It always makes my day to see your comments. Hope you all have an amazing 2012. Here's to lots of wonderful sewing adventures to come! I cannot think of any other word than 'beautiful.' Beautiful, beautiful, beautiful. You are off to a spectacular start to the new year! @Melizza Melizza you are wonderful! Thank you so much for your comment! It's a fab dress! I really like the way the lace is cut away down the sides in the back. Very sharp! I agree about having stronger fabrics for more fitted designs, especially below the waist. Having a thick elastic band for a waist sounds odd, but looks great! Well done you! Stunning dress! And wonderful craftsmanship! Congratulations! Beautiful!!! This dress blows me away. Your design aesthetic is amazing. Yay for you. You, Mrs Julia, rock my fabric loving world! Fa-bu-lous! You look to die for...Absolutely amazing! Wow, very pretty, that lace is amazing! Stunning dress - you look amazing, as always! Poly and silk blend - I'm intrigued. The lace detail is gorgeous and I love an elastic waist band. It's totally beautiful, and worth all your preparation for the remnant sale. I love it. I feel your pain on the remnant sale - my local fabric store has biannual 40%-50% sales in January & July. I made the mistake of going yesterday, on the first day, and I thought I was going to have to beat a bunch of old ladies away with bolts of fabric. MINE! I saw it first! Haha! I would never have thought to use elastic as a waist band, but that looks so classy and wonderfully fitted! I love what you've done with such a tiny amount of lace. Those cap sleeves are the perfect embellishment! Gorgeous! That's all I can say! wow you should be proud, both of surviving the Clegs remnant sale and making this dress :-) I think the design you have come up with shows of this gorgeous fabric perfectly. Oh, I'm lovin-the-lace. This is by far my favourite creation of yours. Loved reading your burdastyle feature too - I relate on just about every level! There are some lovely laces about at the minute - love your creation!! and congrats on the Burdastyle feature too. Oh, that lace is stunning! And who can say no to well done elastic? Noone! 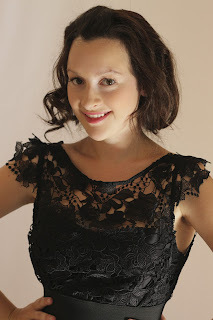 What a cute dress and a great use of lace! Love the detailing with the lace edges. WOW - that is one show-stopper of a dress! That lace is so beautiful, no wonder you snatched it up as quickly as you could. LOVE IT. The dress is stunning. WOW is all i can say! What a stunning dress - you look amazing! Excellent work. I thoroughly enjoyed your BurdaStyle article. This is perfection in a dress. Congratulations! In a word,WOW! This dress is STUNNING! I've linked to your blog from BurdaStyle and am having a lot of fun looking at all your amazing projects! You're insanely talented! Incredibly jaw-dropping gorgeous! I love your elastic-fantastic waist technique. Great job! Absolutely gorgeous. Love the lace and the back is fabulous. Stunning and lost for words!! Thank you everyone for your incredibly awesome comments that makes my day full of warm fuzzies! Wow! That is truly stunning! Thanks so much for the tips on using lace. I am in the midst of making my daughter's graduation dress from a similar guiper lace and have been reading everything I can find on how to finish the edges!Your dress looks like a million! wow love this, u're really talent and you have a great figure too. This is one of the most beautiful dresses I have ever seen.. I would absolutely love one of these.. Amazing! Hi from Ireland! Just gorgeous!!! and the fit is fantastic. As is just about everything on your blog!! Love lace myself, and you've found some fab pieces!!! How lovely!!! That lace is stunning. Love the dress. 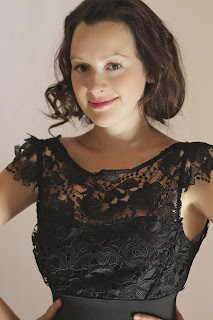 This has been helpful, I've been trying to figure out how to finish the armhole on guipure lace with a see thru back. I'm doing a bit of Throwback Friday and revisting all your beautiful past projects :) LOVE this dress. Hello Julia, I'm knew to sewing and just discover your blog. Such a source of inspiration !! This dress is gorgeous. I'm in the middle of making the Colette Albion jacket for my husband and I'm lin love with this dress, soo beautiful. Would you happen to have a pattern for it somewhere? I know you created it but I thought maybe you had a tutorial or something somewhere on your blog. Thank you so much and have a great day.